In March Pittsburgh’s peregrines engage in courtship rituals that cement their pair bond. Some are the courtship flights described here. Others are “familiarities on the cliff” called ledge displays. Early in the breeding season ledge displays may take place elsewhere but as egg-laying time approaches the pair performs them at the nest. 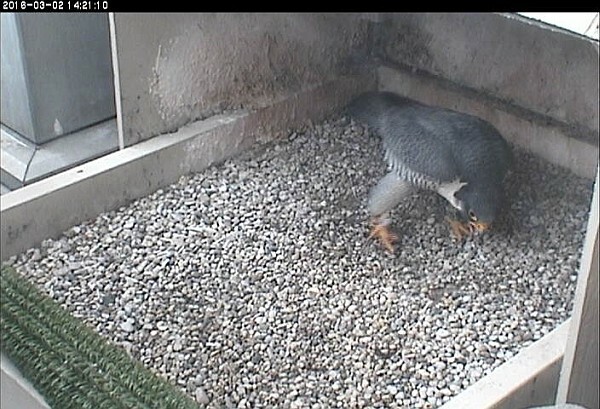 You’ll see these activities on the Gulf Tower and Cathedral of Learning falconcams. How long the male continues this display depends on the female’s reaction. At the Gulf Tower you’ll see that Louie is a master at the tippy-toe gait and is quite loud. On the Cathedral of Learning falconcam the view is so narrow that you can’t see that Hope is watching from a perch nearby; E2 is looking at her. 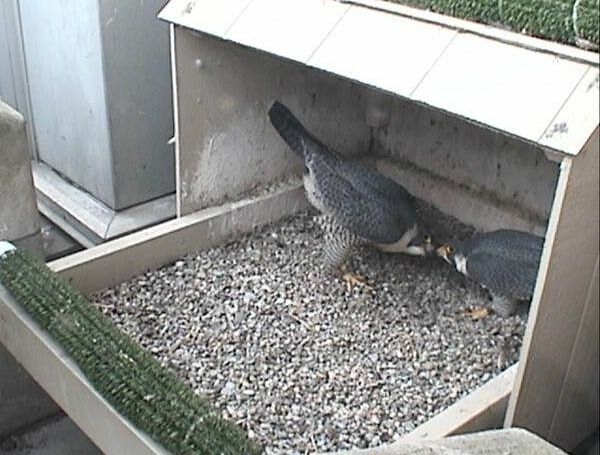 In mid-winter when peregrines first begin this ritual the bowing may last for only 10 seconds. In March when the female is only days away from egg-laying, the ceremony lasts longer and becomes more intimate. The pair calls softly and twists their heads to opposite sides while they bow. Sometimes they even touch beaks. The male usually leaves the nest first. The female stays behind. Watch the Cathedral of Learning and Gulf Tower falconcams and you’ll see what I mean. p.s. Want to learn more? See my Peregrine FAQs. I’m smiling!!!!!!! We just love this activity!!!! The “high stepping tip-toe gait” sounds adorable. Since I can’t view cams I’ll just have to imagine what this looks like. One of the Pitt Peregrines was doing nice swoops & circles around the top of the building yesterday around 4:30 PM. Maybe Dorothy, getting ready to join E2 for some “familiarities”? Sadly, the light turned green and I had to stop watching! I am on the 23rd Floor of the CL facing H. Chapel and my window is open most days. I could hear them calling in the late morning this week. I am Looking foward to hearing them yell at their new flyers late in the spring as they learn to fly around the CL and the Chapel. They sound like parents instructing their kids to drive!